One of the more interesting succulents in terms of foliage is Echeveria Blue Curls. It is also one of the most sought after cultivars. With wonderful waves of frilled to ruffled foliage, and good colour as well this is a stunning plant both in containers and in the garden. The foliage forms a rosette, very frilly and looking a lot softer than many succulents. Over time it will form a short thick stem. This is a succulent that grows well in full sun to light shade. Very decorative in appearance and it can be a real feature plant in a decorative pot. Use Echeveria Blue Curls by itself in a decorative container. They do look good in terracotta pots. Try underplanting large specimens with low growing succulents. Grow it in the rock garden or succulent garden. Best grown in containers in all but warm climates. This allows the plant to be overwintered indoors. One of the main care factors is watering, the potting mix needs to a the dry side at all times. Over watering will cause root problems. Use a specialist free draining succulent potting mix. Bright light is essential, full sun to strong filtered light. If you do bring Echeveria Blue Curls indoors over winter entire that it receives plenty of light and good ventilation. Echeveria Blue Curls rarely puts out offsets like many other succulents. Propagation is generally by leaf cuttings. Spread – 20 cm – Generally larger in warm or indoor positions than in cool gardens. 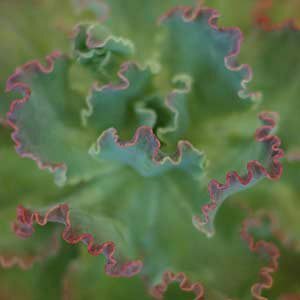 Foliage – Blue green heavily frilled, with red edges and blushes. Soil – Use a specialist succulent potting mix. Position – Full sun to strong filtered light. Watering – Allow to dry well between waterings. Do not over water.